The R-PLEX Human FSH Antibody Set includes a matched capture and detection antibody pair and calibrator for the quick and easy measurement of FSH in biological samples. R-PLEX products leverage MSD’s electrochemiluminescence technology for better sensitivity and a larger dynamic range than traditional ELISAs. R-PLEX matched antibody sets enable the development of singleplex and multiplex immunoassays. Individual assays may be developed using MSD avidin- or streptavidin-coated plates. Custom multiplex assays with any combination of R-PLEX analytes, as well as R-PLEX and U-PLEX analytes, can be developed on U-PLEX MULTI-SPOT plates. To learn more about the advantages of R-PLEX products click here. 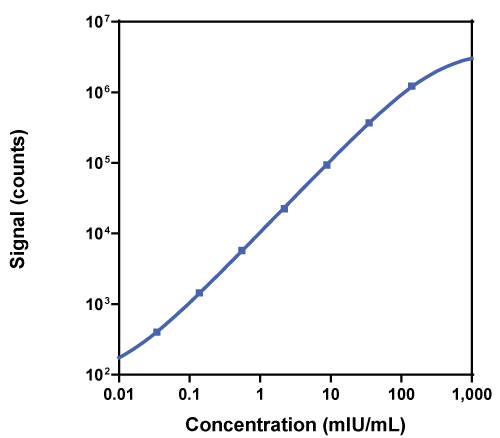 Calibration curve for the R-PLEX Human FSH Antibody Set was assessed and representative data is presented below. Description - Follicle stimulating hormone (FSH, follitropin) plays a central role in mammalian reproduction. FSH is essential for folliculogenesis in the female and spermatogenesis in the male. High levels are observed after menopause and in premature ovarian failure. High levels of FSH have been observed in renal failure, cirrhosis and hyperthyroidism. In men, elevated FSH concentrations have been found in Kleinfelter syndrome, testicular failure, and in azospermic and oligospermic individuals.